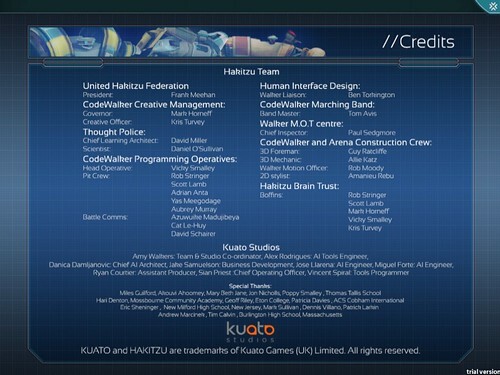 I wrote a post about a week ago regarding the opportunity our students had to connect with Kuato Studios as they worked to develop and release an exciting new app called Hakitzu, which teaches people how to code through a game where they control a robot and fight against another robot by entering code. Check out the video below that shows the game in action! We are proud to be mentioned in the credits for the game (shown below) for this app which has already received positive reviews in day one of its release. Wired had a post titled Hakitzu-Promising AI Platform Blurs Lines Between Gaming and Learning. Others with reviews of the app included Touch Arcade and VentureBeat.